Blix WordPress SEO Theme version 3 was last tested on WordPress 3.1 and no issues found. Update June 2014, the free Blix AdSense WordPress theme hasn’t been updated for around 4 years, have no plans to update it in the near future. If you are looking for a free AdSense WordPress theme use the Talian 5 AdSense theme, looking for a WP theme with AdSense, Chitika, Kontera, Infolinks and custom ads built in, plus awesome SEO features see the Stallion Responsive Premium theme (not free). Consider Blix as an archived WP AdSense theme, will probably have issues with latest version of WordPress. The Fresh design is a popular WordPress theme, apparently ported from another popular CMS. Blix is Widget compatible, works with the new widget feature added to WordPress 2.3 (no theme editing needed). Targeted AdSense Coding: New option from Google AdSense, we’ve incorporated this feature into all of our WP themes including Blix. The targeted AdSense coding can not be used with popular AdSense addons for WordPress, unless you edit your theme manually. I’ve worked as an SEO consultant for around 10 years and guarantee you will not find better search engine optimization WordPress themes (free or premium WordPress SEO theme) online today than my WordPress SEO themes. 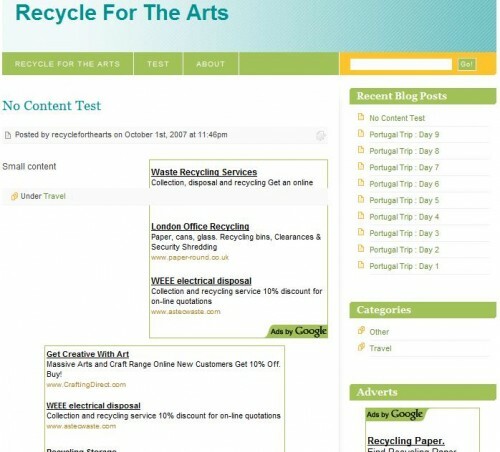 The first screenshot shows the home page of Blix theme. 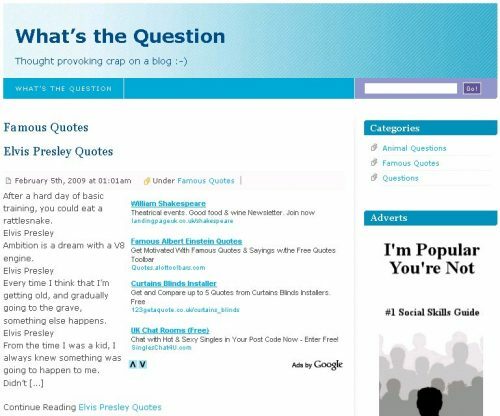 You can see one of the three Google AdSense ad units in the screenshot, this is a 250×250 ad unit that floats to the right at the top of the content of the first post only for those using the Blix template. This location is one of the most clicked areas (AdSense hot zone) and so by utilising this location this ad unit almost always performs well. You will find the same ad units and placement for all pages of the blog, which will maximise AdSense revenue. The second screenshot shows a single post page, this is where individual posts are shown (like the page you are reading now). In my experience it’s these pages that will create most AdSense revenue, especially the 250×250 square unit within the main blog post content (it’s a real hot area). Further down the page is the third and final ad unit, out the box it’s set at 336×280 (large rectangle to catch leaving visitors), but there’s an easy to use options page where ad unit sizes and colours can be changed, so changing the size doesn’t need a PHP programmer or anything :-). 2. Edit the file adsense.php within the /blix-adsense-seo-03/ folder to include your Google AdSense code (read the readme.txt file for more details, very easy to do). 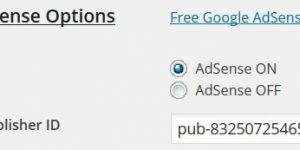 Note: Adding your unique Google AdSense publisher code (your pub-##### number) is the ONLY required change needed to the entire theme to make the theme ready to turn your WordPress blog into an AdSense residual income stream. 3. 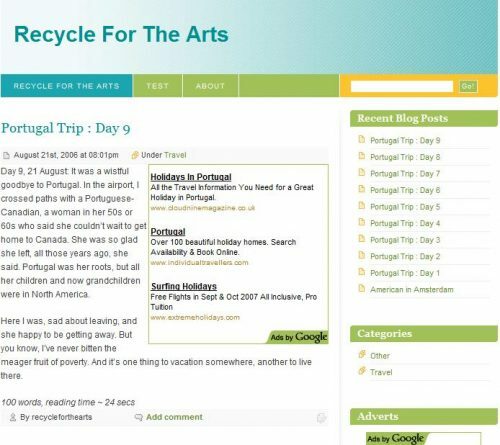 Upload the entire folder to your WordPress themes directory (via FTP, just like any other theme you’ve tried out). 4. Log into your blogs dashboard and under Presentation select the new Blix theme and you are done. The Blix AdSense + SEO theme out the box uses blended ad unit colours and large ad units for maximum CTR/AdSense revenue. If you wish to change unit colours and/or ad unit dimensions this can be achieved by editing just one file. If you don’t like the 250×250 sized ad unit for example, no problem a few minor changes and you could have a smaller 180×150 ad unit. Don’t like image ads, again no problem specify text only ads. Most WordPress themes aren’t too bad SEO wise when downloaded directly from their original creators, but there are always improvements that can be made for maximum SEO impact and the Blix theme was no different. Optimized title elements (and meta tags, though they aren’t very important these days). Take a look at the title of this page, note it’s keyword rich and lacks the name of the site (for SEO reasons). This SEO coding is used on all version 03 WordPress themes from this site. Optimised headers, for example on blog post pages like this one the name of the blog is NOT within a H1 header, (every theme I’ve used has a H1 header that holds a link to home page, this is not good SEO wise). Instead the title of the post is within the H1 header and the link to home is ONLY a H1 header on pages that lack a true keyword focus like the monthly archive pages. 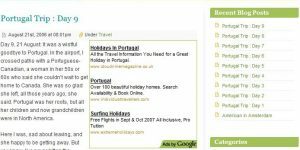 On category pages the category name is used for the H1 header. Optimised anchor text of links. All in all a well optimised AdSense ready theme. Created a new version of Blix with a Blue colour. Blue Blix is this theme with blue colours AND a slightly wider (90px extra) content area allowing the use of the 336×280 AdSense ad unit at the top of the content. I would like to buy this beautiful theme. But,i need to know, how can i change the color of the theme layout?.. How many colors are possible for the blix theme other than your default color and blue color layout? It wasn’t easy to change the Blix color scheme, which is why I’ve only created the Blue Blix version and a Red one I didn’t finish. I bought this theme quite sometime ago. The adsense plugin disappear all of the sudden. I could not find a suitable plug-in for this theme. Where can i paste my adsense id for this theme now? Blue Blix doesn’t use an AdSense WordPress plugin per se, the AdSense code is built into the theme and there’s no way for the AdSense code NOT to be run when a page loads, this assumes AdSense is turned on and you haven’t made any mistakes when you added your AdSense publisher ID etc… of course (recently had a customer with disappearing ads because they added an extra space after their publisher ID by mistake). What you are seeing can happen to any page with AdSense running on it, AdSense determines it’s better for your page not to load all ad units (supposed to result in you making more money). It tends to be the sidebar ad unit that doesn’t load because it’s the last one loaded in the code (Google AdSense assumes if it’s lower in the code it’s the least important ad unit). So it’s not the theme, it’s AdSense. I have a number of Blogspot blogs and see this sort of thing all the time on them (way more often than with my WordPress blogs). I also see it on my WordPress blogs randomly. BTW You can tell the ad units code has been loaded because the size of the ad does show up (you get a blank square/rectangle the size of the ad). Would be better if the ad didn’t load at all, but that’s Google AdSense at fault. How to Test AdSense Ads? I changed to my Adsense Pub ID # within the Adsense PHP file. Assuming that’s the only thing I need to do to connect my adsense account & that IT IS connected to this blog page…how can I tell that my adsense ads are working on this blog page? Where do I look within my Adsense account that I will get the commissions when someone clicks on my ads? I even had a friend click on an ad at my site to see if I would see the commission in my account. I can’t tell. The main page on this domain ) using a default theme with Adsense plugins that are currently working. Not long ago, I applied to google adsense for this domain to be accepted (still don’t know what this is for in my adsense account. I thought I had to do that with your themes), but it got ‘disapproved’. This was about the time when I added a sub page blog to URL above using the Blix theme. Will this disapproval affect my not getting my commissions from my new sub page, even though I am getting commission on the main page using adsense plug ins…despite getting the url disapproved. I don’t get it. Again, how can I tell that my sub page adsense ads are working with my Pub ID # installed within your new Blix theme? All you have to do is edit the adsense.php file found at /wp-content/themes/blix-adsense-seo-03/adsense.php (one setting and it works). Easiest way to check your Google AdSense Publisher ID was added correctly is go to a page with the AdSense theme running and view source. If you see the number pub-8325072546567078 you’ve made a mistake as that’s my pub-number (you should see the number you see in your AdSense account). I see you’ve left my pub-number on your site. If you edited the file via the WordPress built in theme editor you might have edited the wrong adsense.php file. I include two adsense.php files with my version 03 themes, one in the /wp-content/themes/blix-adsense-seo-03/alt/adsense.php folder within the theme which includes alternative AdSense settings. This page is never accessed unless you move it over the AdSense file in the Blix themes main folder at /wp-content/themes/blix-adsense-seo-03/. The WordPress theme editor can’t tell the difference between the two files (at the top it does say it’s an alternative, but easy to miss). So I’m guessing you edited the file online and changed the wrong file. I recommend editing the adsense.php file in the main Blix folder with a text editor before you upload it (you can change the ID of both files if you want, but only the file in the main Blix folder is used, the other is an alternative you have to move to use). Not sure what you mean by you were disapproved for AdSense for that domain. Usually you apply for one domain for AdSense, if it’s accepted you can add AdSense on any domain (anywhere). If you break the AdSense TOS and AdSense notice, the site can be banned from the AdSense program (you won’t see Google AdSense ads if you add the code to a banned domain). Assuming you have an AdSense account and as my AdSense ads are currently showing on the sub site if you change the pub-number correctly it will work (domains are banned which if your domain was banned my ads wouldn’t work) for you. Under your AdSense account setup a domain channel, this will track your AdSense clicks and impressions only for that domain (I setup a domain channel for every domain I have AdSense on). The different adsense boxes have different ads in them. Some advertizers only bid on one or two of their favorite sizes. I want to use the three main sizes of boxes on each page, not three of the same size. Hi, I seem to have a problem all of a sudden with my Blue Blix SEO theme. all of a sudden, the sidebar is all the way at the bottom of the page, and the content has shifted from the left side of the page to the middle. I tried reinstalling the theme, and removing my cookies, but still have the same problem. Had a look at your sites code and ran it through the W3C Validator and there are no important errors (only error is related to a widget you are running with no content, looks like the Links widget). Without looking at the css my guess would be a plugin has broken the css coding, I see a link at the bottom of the footer about a Theme Tweaker, I’d first try disabling it and see if it’s the issue. If not disable all plugins and see if the problem still occurs. Looks like what’s happening is the main content is too wide and is pushing the sidebar down the page. This can happen if the css code is changed and you’ve made a mistake or a plugin has added css coding that clashes with the themes styling. I have deactivated all the plugins, but still no change. What I did in the beginning, was add an aweber plugin, to ad a subscriber email catcher, but I didn’t like the way it looked, so I took it out the sidebar. As soon as I did this, it began to look the way it does. I have now deleted the aweber plugin, but it still looks the same. Figured out your problem, you’ve got one too many links on your top navigation menu. The link that’s causing the problem shows when you hover over the home page link (on the navigation menu) and slide the mouse down a little (says Auto Draft). The Auto Draft Page link should not even be listed here, it’s a bug I’ve fixed, if you ordered a while ago you’ll have old code, drop me an email (make sure you use the email address you ordered with) and I’ll send you the latest zip file. If you do add more static Pages you’ll have this issue again. Problem with themes with a top navigation menu is you have to limit the number of pages added to that menu or disable it completely as otherwise you get too many links. In the example above your Navigation menu would show Pages 5, 12 and 27 only (and the home page link).